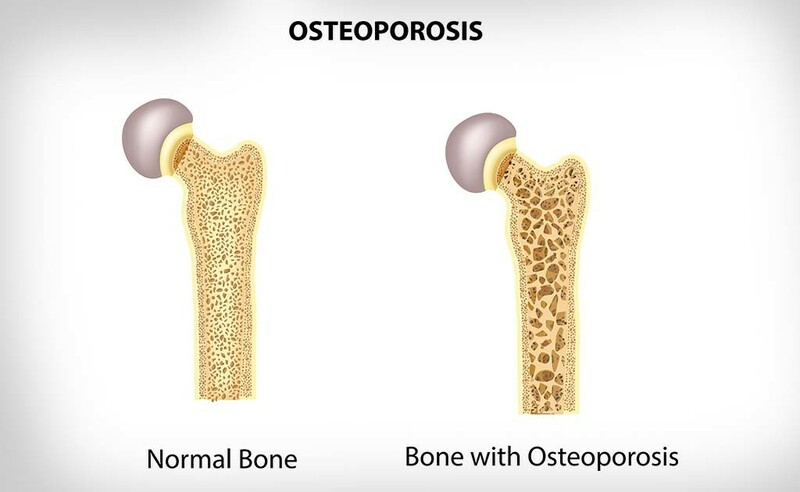 Osteoporosis is when your bones become thin and brittle. It is caused by a lack of bone strength or bone density. Similar to a sponge, your bones contain numerous holes which makes it fragile and can lead to hip, spine, or wrist fractures. This disease is usually found in older adults after age 60 and women are more likely to have osteoporosis than men. The risk of getting osteoporosis increases as we age and a woman who has gone through menopause has a greater risk. Other risk factors include a slender body, family history, people of European and Asian background, smoking, alcoholics, not getting enough weight-bearing exercises, and a lack of calcium and vitamin D intake. The first sign of osteoporosis is usually seen after a fall or bump where a fracture is found in their hip, spine, or wrist. They would later on experience back pain, notice their height has shrunk, and notice a curved backbone. A bone density test can be completed to measure the thickness of your bones and the risk for a fracture. Calcium and vitamin D is essential to building strong, healthy bones. In addition, exercising and quitting smoking can help slow osteoporosis. In order to avoid bone fractures from occurring, it is important to get a bone density test and get osteoporosis treated early. Lordosis is located in your neck and spine. Cervical lordosis is when there is an inward curve in the region of your neck. When there is an inward curve in your lower back, it is known as lumbar lordosis. It is more common for an individual to have lumbar lordosis than cervical lordosis. Obesity, osteoporosis, poor posture, spondylolisthesis, and kyphosis are a few causes of lordosis. Someone who does not have this condition would notice their ears are lined up over their hips, shoulders, and ankles. Individuals who experience lordosis would have a noticeable curve that could be seen. In addition, they might experience discomfort, severe back pain and/or tense muscles around the curve. Lordosis could restrict their movements and create a space in between their neck or lower back and the floor when they are laying down. Physical therapy can help with strengthening, and increase your flexibility and range of motion for your neck and spine. Exercising, stretching, using extra pillows when you go to sleep to support your spine, and wearing a neck immobilizer or thoracic spine brace are all possible treatment options for lordosis. A healthy spine is made up of vertebrae that look like cylinders put on top of one another to form a column. Kyphosis is when the vertebrae in the upper back is more wedge shaped, which leads to an excessive, forward rounding of the back. It can appear in infants or teens, but it is most commonly found in older women. In addition to an abnormal curvature of the spine, someone who has mild kyphosis can experience back pain and stiffness. Fractures, disk degeneration, birth defects, osteoporosis can all lead to an abnormal vertebrae. Kyphosis is linked to weak back muscles and an individual can have difficulty walking, driving, and looking up. Pain can also be felt when the individual lies down and there can be problems with breathing and digestion if the situation is severe. Depending on the individual’s age and the cause, the treatment can vary for each individual. Ankle sprains are a common injury that can lead to severe pain and weakness. We can work on various rehabilitation exercises to help our ankle heal and prevent future injuries. After the injury has occurred, it is important to perform partial weight bearing to prevent muscle atrophy. When you are able to walk again without limping, you can work on full weight bearing. You should begin with range of motion exercises, such as plantar flexion, dorsiflexion, inversion, and eversion. You should not feel pain when you perform these ankle movements. You can then practice writing the alphabet with your toe and work on towel assisted stretches with the same ankle movements. Next, you can do strengthening exercises, such as performing the ankle movements against the wall or using a rubber tubing looped around your feet for resistance. After, you can move on to balance exercises on a wobble board by doing a double leg stand with eyes opened and then closed. Then, standing on your injured foot with eyes opened and then closed. By following these rehabilitation steps, you can help strengthen the ankle and prevent an injury from occurring again. Copyright © 2017 Rupert Health Centre Inc.